Late Jan I started building small GBPUSD positions. The highest entry was at 1.3180, the lowest was at 1.2805. The reason was the shift in the Brexit outcomes, which sent no-deal down to the bottom of the list and left only GBP positive options. As the UK Parliament fought against a no-deal, and the chances of a deal were rising (at the time), that played into my trade. However, as traders we have to be aware of changes to any situation and thus our strategies, and we’re slap bang back into the middle of one now. The extension was already a risk point I foresaw (and have written about repeatedly recently), and one where a no-deal might start creeping back up the outcome list. As I mentioned previously, there were/are risks with an extension, and whether the EU would approve it, or squeeze the UK into trying to get a deal done by 29th March. Lo and behold, here we are with the EU pushing for a short extension and only if May has a deal that’s been approved by Parliament. That decision isn’t final yet but that’s what the market has to play with. That squeeze from the EU now raises the no-deal expectations because May only has her deal or no-deal and more MP’s are starting to side with no-deal over backing her deal. So, the risk to being long GBP have risen markedly (you only have to look at today’s GBPUSD chart to see that) and that’s now forced my hand on the long trade. It was last week I started to plan for the events of this week, as it’s my style to always manage my trades with a view of what can happen in the future, so I knocked out half of the position at various levels above 1.32 last week, taking advantage of the market’s same view that the positives outweighed the negatives. Earlier this week I moved the stop on the balance up to 1.3090, and that’s been hit today in this drop. That’s this trade done and dusted and some good pips made on building up small positions across a wide area of the price spectrum. This enabled me to keep my risk low and avoid some of the intraday noise. 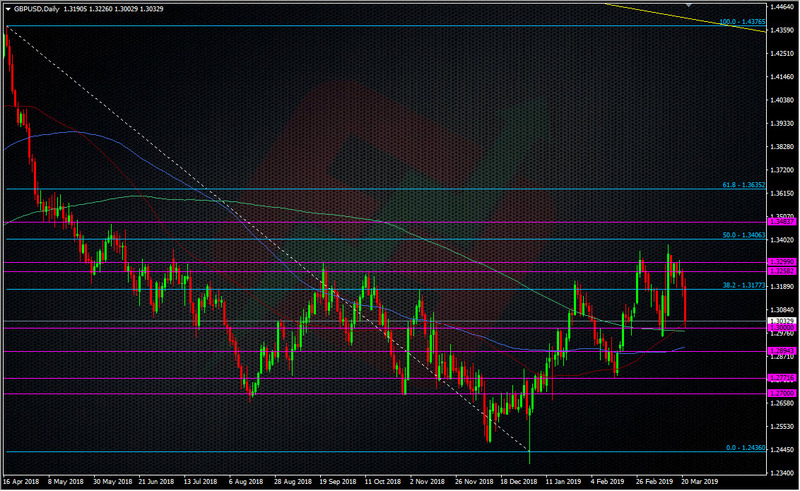 Now, I’m back to being neutral on GBP and I’m happy to sit back and wait for the next opportunity to arise. The risks for Brexit now are symmetrical and once again, the headlines will dominate and decide the next direction. On a technical basis, 1.3000 was a level I had on my radar to add back in to my longs but because the landscape has changed now, I’m not interested. You can cherry pick your levels all the way down, and many technical analysts are, citing this line, that line and everything else in between. Technical analysts are one thing, traders are another. Not every TA can be a trader but every trader can be a TA. I don’t trust any of the tech on the GBP charts right now and so it doesn’t matter where I draw my lines. That said, the levels are there whether we trade them or not. About the only place I’d be interested in buying GBPUSD would be from 1.28-1.27 but if we’re down there, it’s likely something troubling is going on so I’d be cautious. As always, I’ll only plan any trades around my assessment of Brexit and that’s something I do regularly in our live trading room. That’s where this trade was first planned and hatched, and where all the levels were given and traded as they happened. That’s where the next big trading opportunity will happen in real time. There was no hindsight trading or head-start prices in this trade. In our trading room, there’s no TA waffle that’s not backed up by people willing to put their money on the line. This is the only way to trade, and analyse trading. If you really want to know where the best opportunities are, and be part of a group of traders who trade real money on their decisions, and who know how to cut through the waffle analysis to find the best trades, come and join the ForexFlow community.